It’s funny how I never really paid attention to the Moon, even as a magician, for years and years. Yes, I’d check a calendar to see whether it was waning or waxing when making a particular talisman or other, and maybe I’d be caught off-guard and wonder why the nighttime is so bright outside before looking up and spontaneously saying my Full Moon invocation from the PGM, but beyond that, the motion of the Moon was simply something I never paid attention to. That was, of course, until I started working on my grammatomantic calendar, a lunisolar method of tracking the passage of the Moon against the seasons and the yearly passage of the Sun. It was a short leap to make from assigning letters to the days to assigning rituals to the days, and I ended up in short order making a ritual grammatomantic calendar based on the individual days of the months. In the past, especially when getting the discipline of mathesis kicked off (which I’m still working on getting back into after so long), the use of the ritual grammatomantic calendar cycle has really helped before. 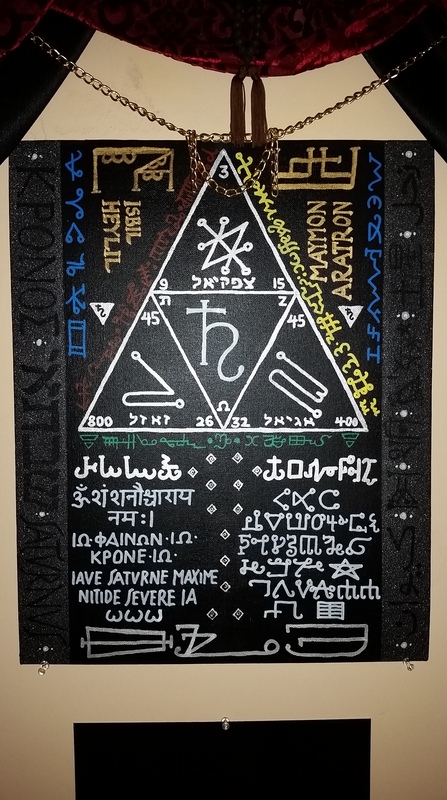 In short, I’ve termed the whole system of a lunar grammatomantic calendar, with all its prescribed rituals and applications, as the Grammatēmerologion. There’s an interesting side-effect to how I set up the Grammatēmerologion, however, and one of those side-effects is coming up in short order. The Grammatēmerologion system includes a way to not only assign the letters of the Greek alphabet to individual days of the lunar month, but also to whole months as well as to whole years. For instance, this past Noumenia (the first day of the lunar month, starting at the sunrise after the New Moon) had the day letter Α (first day of the lunar month), which started off the month Β (second month in the lunar year) in the year Ε (fifth year of the 38-grammaterological cycle). This system of day-letters and month-letters can be exploited in a ritual way by using particular days when the day-letter and month-letter are the same. When the day-letter matches the month-letter, we have what I call a Μεγαλημερα (Megalēmerai), or “Great Day”, a day when the effect of the day-letter upon the world is significantly stronger than it would be in a month when the day-letter does not match the month-letter. A Megalēmera for any given letter occurs only once every two years since there are twelve (or, sometimes, thirteen) lunar months in a given year, and since there are 24 letters in the Greek alphabet, it takes two years to cycle through all the Greek letters for each lunar month. As you might have surmised, dear reader, we have just such a Megalēmera coming up on Monday, August 17, the third day of the third lunar month of this year, when both the letter of both the day and month are Γ. The letter Gamma is associated in the system of grammatomancy with the astrological sign of Taurus, and thus with the goddess Aphrodite according to the Orphic system of zodiacal-theological correspondences. I would find it an exceptionally fine day to honor Aphrodite on this day for this reason, with the necessary mathetic and ceremonial flairs, of course, and I’d like to talk about just such a ritual. I already have a framework for a generalized mathetic invocation and offering to the gods, so we’ll use that as a template and build off on that. After all, if that sort of ritual is good for any ol’ day, then we’ll want to make it comparatively greater to make it fitting for a Great Day. This is the first time I’ve made any sort of ritual for a Megalēmera, so this is an experimental setup for me, although I think it’s well-grounded enough to be used in the future, as well, with some tweaks here and there based on how this setup goes. On the day before the Megalēmera (Sunday, August 16), prepare the shrine accordingly if you do not already have one set up. This should be done at some point before sunrise on the Megalēmera, so it can be done in the wee hours of the dark morning if you can’t do it on the day before, if needed. The shrine should be left standing until sunrise on the day after the Megalēmera, so that it can be active during the entirety of the Megalēmera. While we’re setting up the shrine, we’re preparing a suitable basis to honor Aphrodite on the Megalēmera itself, but we’re not making any offerings at this point. Only the mathetes, or mathetic initiate, is to prepare the shrine, and the mathetes alone. Other forms of personal preparation, such as fasting, can be done at the mathetes’ discretion. Before touching or preparing anything, cleanse yourself using khernips. You’ll be using a lot of it, so make a decent batch for this day. It helps if you also do all the usual mathetic daily stuff ahead of time to prepare yourself accordingly. Go outside and find four small pebbles, preferably from a crossroads or a driveway. Set these aside for now. Sprinkle khernips around the area and in the air of the area where the shrine will be erected. Chant “απο απο κακοδαιμονες” (“begone, begone evil spirits”) while doing so. Obtain an elevated platform, e.g. a table or shelf, that is at least waist-high. Wash off the surface of the table with khernips. This will form the foundation of our shrine. Cover the shrine with a cloth. For Aphrodite, according to the color scheme I use, I suggest something green, ideally with shades of emerald or reflective green against a solid brighter green. If you can get something with a floral or organic design or pattern on it, even better. Obtain an image of Aphrodite; this can be a statue or a framed picture. Wash off the image in khernips and set it in the middle of the shrine. Obtain three white candles or clean olive oil lamps, each washed off with khernips. On each candle or lamp, engrave or write the letter Γ three times. Set the three candles or lamps around the image of Aphrodite in a triangle, with one behind her and two before her, and light all three. Set an empty cup or small bowl to the right of the triangle made by the candles, a censer before it, and a vase to the left of it. Also set three green candles engraved with the word ΑΦΡΟΔΙΤΗΙ (“to Aphrodite”) around the image of Aphrodite, but not where the three white candles are. Unlike the rest of the offerings, these candles are not to be washed off in khernips. Anchor the image of Aphrodite in the shrine by performing the Tetractys Meditation. Modify this, however, in the following way: after visualizing and holding the image of the Tetractys in your mind, project the image onto the surface of the shrine, with Aphrodite standing in the middle of the Tetractys with the three flames at the three outermost pointsof the Tetractys, and connecting the image to the 24 paths of the Tetractys from where she stands in the middle. Visualize the flames to burn a bright emerald green, and to fill the whole visualization with green light from them through all the paths of the Tetractys into and around the image of Aphrodite. Fix the visualization as strongly as you can, and silently breathe the name of Aphrodite three times onto the image of Aphrodite on the shrine, fixing the visualization in the material form. Get those four pebbles you gathered a bit ago, and wash off each in khernips. Hermes Diaktoros, you are the god of guides and guide of gods, men, spirits, souls, and heroes. Hermes Odolysios, you open the doors and clear the roads and smooth the paths. Hermes Theogogos, you lead the words and presence of the gods to the world of man. Hermes Pompaios, you lead the hearts and minds of men to the world of gods. Hermes, open the way for Aphrodite to take her seat here on her throne, that I may honor her as is her due and that I may derive from her the blessing that is my desire. Take another white candle and wash it off in khernips. Place this between the shrine and the pebble closest to the shrine. Take the cup of wine and oil used for the pebbles to the nearest road, along with any remaining khernips. Throw the wine and oil out into the road as an offering to Hermes, and return home without looking back. On the way back, sprinkle all the remaining khernips from the road back to your house to cleanse the way for the goddess. With that, the preparation for the shrine is complete. Spend some time getting wine, olive oil, incense (I suggest rose mixed with benzoin), flowers (ideally roses, at least red but preferably of three different colors), and any other offerings you might want to make, including jewelry, fruit, honey, sea-water, shells, copper, statuary, and the like. The candles or lamps are to be left until they burn out, and the proper Megalēmera ritual can only be done after they have done so, so be sure to set up the shrine with enough time beforehand. When they burn out, remove them from the shrine; beyond this, no further work is to be done between the time the shrine is erected and proper ritual on the Megalēmera. On the Megalēmera itself, at sunrise, do your normal mathetic ritual daily practice as usual. Ideally, performing the Megalēmera ritual immediately afterwards would be best, but if not, they can be performed at any time before the next sunrise. The Megalēmera ritual is to be led by the mathetes, but any others who wish to join in to honor Aphrodite as well may do so, so this can easily become a communal or community ritual or feast. Open a window or door to allow Aphrodite to enter the shrine. Even a small crack is sufficient, so long as there’s some way to the outside. Needless to say, if the shrine has been set up outdoors, then no such step need be taken. All present are to dress primarily in white, with green or copper accents or jewelry if desired. Before approaching the shrine, all are to wash off with khernips. Perform the Tetractys Meditation together. If desired, in another place nearby facing away from the shrine, make an offering to Hestia in some way one might choose as eldest and youngest of the children of Rhea and Kronos. This is intended primarily for the more Hellenistic crowd, and is not strictly required according to the practice of mathesis, but may be done if so desired for ritual propriety’s sake. Sanctify the area of the shrine once more with khernips, by sprinkling khernips around the area and in the air of the area where the shrine is erected while chanting “απο απο κακοδαιμονες” (“begone, begone evil spirits”). Approach the shrine, and pick up each of the four pebbles one by one that lead up to it. When all pebbles are picked up, stand up and, with the pebbles in the right hand, call upon Hermes as before. Place three of the pebbles around Aphrodite at the exact spots where the three candles or lamps stood the day before, i.e. at the three points of the anchoring Tetractys. When placing each pebble on the shrine, say aloud “Hermes, lead Aphrodite to us”. Take the fourth pebble and touch the image of Aphrodite with it, and say aloud “Aphrodite, be here with us”. Place this pebble on the image of Aphrodite or just before the image, touching its base. Light the white candle and begin the letter chant-meditation on the letter Γ, including a chant for the sacred name of the letter, which for Γ is ΓΕΝΙΟΜΟΥΘΙΓ (Geniomūthig). Continue this until a desired and sufficient numinous power has been built up for the letter and its associated goddess. Knock on the shrine and call out the name of Aphrodite three times, then pray her Homeric Hymn. Either the short hymn (Homeric Hymn #6) or the long hymn (Homeric Hymn #5) may be used, with the very short hymn (Homeric Hymn #10) used only if pressed for time. Other hymns, such as Proclus’ hymn to Aphrodite or one independently written, may also be used. Announce yourself fully by your full name, as the child of your parents by their full names, and any mathetic or magical name you may use before the gods. Announce yourself fully and openly that Aphrodite and all in attendance, whether god or mortal, may know who you are without deceit. All others may announce themselves to Aphrodite as well, at least using their first names but as openly as they choose to. Dedicate all offerings to Aphrodite. Light the three green candles on her altar, followed by the incense which is to be placed in the censer. Pour out wine, olive oil, fresh water, and honey into the offering cup or bowl for her. Place flowers in her vase. Place any other offerings to be dedicated to Aphrodite around her shrine as well. Only the mathetes is to light the candles and incense and to pour the libation into the cup, but everyone else may give their offerings afterward. Everything placed on her shrine is to be joined with the words “for Aphrodite on this Great Day”. All present are to recite the Orphic Hymn to Aphrodite at least once, ideally three times. After this, the mathetes is to make any supplication, request, personal prayer, or praise of the goddess. All others in attendance may do the same one by one, with the mathetes standing off to the side and the others stepping before the shrine. Remember that all prayers are to be said aloud, as is customary for the Greek gods; silence should be reserved for meditation. Celebrate the Great Day of Gamma by sharing drinks, food, and leisure amongst each other. Those who wish to do so may meditate in the presence and glory of Aphrodite on her shrine and continue their prayers. Share her stories, talk about her powers, and do all that may be done to exalt and honor her in her presence. Additional libations may be made by pouring the first part of one’s drink into her bowl before anything has been drunk from the cup, along with a plate with the first part of all food given to her, if so desired. When all celebration and meditation is complete, the mathetes is to bring the ritual to a close with all present. Thank Aphrodite for her presence, blessing, and graces, along with all her divine entourage, and ask her once more to accept all offerings made to her as her gifts and property. Bid her farewell respectfully, asking that she stay or go as she so desires, and acknowledging that she will be honored again at the proper time after she leaves. After this, the Megalēmera ritual is complete. After sunrise the next day, long after the candles and incense have burnt out, the shrine is to be dismantled and the image of Aphrodite formally unanchored from the shrine, and all offerings made to her are to be disposed of respectfully. Once more, prepare another decent batch of khernips, and wash yourself off with it. Sprinkle khernips on the pebble touching the image of Aphrodite, and in doing so, visualize the light that anchors the image of Aphrodite to the Tetractys dissolving, with the Tetractys and Aphrodite both filled with green light yet as separate entities. Sprinkle more khernips on each of the three pebbles around the image of Aphrodite at the distant points of the Tetractys, and in doing so, dissolve the paths on the Tetractys into a floating green formless light. Breathe in the green light that results from this. Circulate this green light through your body; once you have been “flushed” with this light, breathe it out and into the world. The image of Aphrodite is to remain filled with green light on its own; the image is to be removed and kept at her usual place, or another permanent shrine may be built for her. Take the four pebbles and a good amount of khernips and go out to the road, sprinkling khernips before you every step of the way. Throw the pebbles into the road and any khernips that remains, and thank Hermes for his guidance and help in the worship done the day before. Alternatively, the four pebbles may be used to build up a herm for Hermes, with the khernips splashed across the herm. All perishable offerings made to Aphrodite (food, fruit, flowers, waters, libations, etc.) along with any incense ash is to be collected and disposed of respectfully outside. Any river, beach, or body of water is good to deposit the offerings into; if none of these are possible, they may be deposited at any crossroads after splashing khernips onto the crossroads. All nonperishable offerings made to Aphrodite (jewelry, stones, metals, pictures, etc.) are to be split evenly between the mathetes and any other person who has a shrine to Aphrodite. These possessions are Aphrodite’s, not belonging to any mortal, and must remain so. If there are gifts made that are not accepted by anyone, they are to be respectfully buried outside, either at a crossroads if the Megalēmera ritual was done inside, or on the spot where the Megalēmera ritual was done if it was done outside. The remainder of the altar is to be sprinkled with khernips, and dismantled and washed in whatever way one may desire. And that’s it! I’m looking forward to honoring Aphrodite in this way, and I’d like to see how it plays well with her. 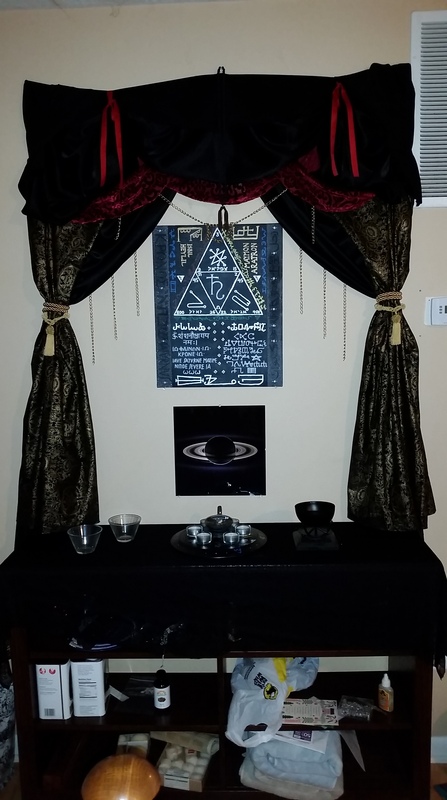 This is something substantially bigger than any weekly or monthly offering I’ve made to her yet, though it follows the same overall format; since I already have a tiny shrine for her in my temple room, I plan on setting up her Megalēmera shrine in a more grand manner in my living room at the center of my house. Hopefully, I can use this same format for other Megalēmera rituals, and those who can figure these things out can determine how they might be done for other gods and goddesses in the Greek pantheon using the same mathetic format. While it’d probably be best to honor each and every god for each and every Megalēmera, if I were far more invested in the time and energy to honor the gods as properly as they should be, I’ll really only focus on the ones I’m more intimately connected to, either by spirit or profession or purpose; I don’t plan on throwing twelve Megalēmerai a year, maybe only a handful, depending on the god in question. Still, such a grand celebration can easily be done as desired for each of the gods that can be associated with the Greek alphabet on these Great Days. Where(ever) man is, also (is) God. God does not appear to anybody but man. Because of man God changes and turns into the form of man. God is man-loving and man is God-loving. There is an affinity between God and man. God listens only to man, and man to God. God is worthy of worship, man is worthy of admiration. God does not appear without man; man is desirable to God and God to man, because desire comes from nowhere, but from man and God. “[Both God and man] are one: God and man after the species” (I.1); “nothing is uninhabited by God…God is in heaven, and heaven in the world” (III.1); “God is within himself, the world is in God, and man in the world” (VII.5); “everything is within man” (IX.4). These are all things we’ve seen before: not only does God dwell within the soul that dwells within the body, but that not only is Man within God, but God is within Man. Moreover, “whoever thinks of himself in Nous knows himself and whoever knows himself knows everything[;] everything is within man” (IX.4). This tightly couples up the identities and existence of God and Man so closely, especially with knowledge itself delivered by God/Nous/light being everywhere as it is. Man, being endowed with Nous, can know all things, and can in a way be everywhere just as God is everywhere. Thus, this definition starts off with a profound statement: “wherever man is, also is God”. We are not only made in the image of God, and we are not only endowed with the power of God, but we are with God wherever we go. We are always within and with God, so perhaps it’s not shocking, but this definition makes it clear that we are never separated from God. Moreover, “God does not appear to anybody but man”. This is probably shocking, but consider that Man is the only one among the living beings capable of Nous. Because of this, we’re the only ones who are able to transcend the material realm (VIII.7), and we’re the only ones capable of examining the entirety of creation (VI.1, VII.2). While Nous sees all things through all souls, only Man among all the ensouled creatures can know Nous in the other direction, and in the process know himself and all other things. Other creatures are limited in what they can see, and can only see themselves and their own worlds that exist within God. But Man is Man because “he has got a notion of God” (IX.1), so only Man truly understands what God is, while other beings don’t. Man is special because he alone can know God, and since knowledge is so tightly bound up with light and sight, Man is special because he alone can see God. Thus, “God does not appear to anybody but man”. Of course, if we can see God appear, then that means God must appear sensible to us, but we know that God is intelligible. But that’s not always the case: “because of man God changes and turns into the form of man”. God condescends down to us and takes on a human form, which allows us to know God. This can be taken in two big ways, as far as I can tell: either God comes down as his own human to lead us to God, or God comes down as us and becomes us so we can know ourselves to know God. The former is basically soteriology: we have some savior, some divine human (as if humans aren’t divine!) who comes down as God and appears to us, speaks to us, and leads us; this could be Jesus, or Dionysus, or Horus, or Mithra, or Krishna, or any other savior-god. This allows us to witness God as something external to ourselves (though this isn’t ultimately true, but in the world of forms and matter it can appear so), making it easier for ourselves to know God through the God-human. On the other hand, God comes down to the world as us, taking on human forms as us, and lives down here as us. In this case, it makes sense why human souls are given Nous; that’s God who dwells within us, and by coming to know ourselves, we come to know Nous, and we come to know God. In either case, we are made as God and as gods to know God, and to do this, God appears to us in ways we can understand. But why? Why does God even bother with us? “God is man-loving and man is God-loving”. God loves us. With knowledge, there is no fear (IX.3), but now we know that love is the opposite of fear. With knowledge, we love God, and God loves us. God, by extension, loves everything, since everything is within Man and everything is within God and Man is within God and God is within God, but we alone are the only form that God takes down here, and it’s for our sake. Everything God does is for our sake (VIII.2), because God loves us. This isn’t some passionate romantic love, but this is an existential, “you are family”, “you are part of me”, “you are me” love. This is agape, the unconditional love of God for Man, a promotion of well-being in response to having been made well. “There is an affinity between God and man”, suggesting that everything between God and Man is mutual, and that we love each other, as spouses love each other. Together we form a whole, as was mentioned in I.1. Not only does God appear only to Man, but “God listens only to man, and man to God”. Just as God appears to Man because Man is the only creature endowed with Nous to know and sight to see, God listens to Man because Man is the only creature capable of Logos to speak reasonable speech. Logos is the servant of Nous, and is the only means by which we can come to approach and know God (V.1). All reasonable speech is of God, while unreasonable speech is only worldly (V.2, V.3). Thus, God only listens to reasonable speech, and the only source of that that is not itself is Man, so “God listens only to man”. Man, however, listens among himself and the words of others, but can also listen to God. Whether an “only” is omitted in that latter half of the statement or whether it was intentionally left out is not known, but if we assume the parallel structure here omitted it, then “Man [listens only] to God” is what we should be reading. All speech comes from the world and the voices it produces, though reasonable speech comes from voice and Logos used at once. But the world and all voices all come from God, and voice is used according to one’s nature, whether Man or any other creature, and “nature is the mirror of truth” (VIII.5). Whatever Man hears, he can understand, and he can understand it with reason even if the original utterance was unreasonable. Thus, no matter what is said, or where or when or by whom, Man listens only to God. God loves us and is so much bigger than us; this we know now, but we also know that everything is within God, and everything is within Man. So which is “bigger”? When you deal with matters of infinity, things can always get a little hazy, since God is truly infinite while Man is…well, Man is finite. But yet we have everything within ourselves; this isn’t as much a literal truth as it is a reflection of it. So, rather, while Man is by nature representative of God, God is in truth God; we might say that Man is the nature of God, especially if God appears in the world as Man and if truly “nature is the mirror of truth” (VIII.5). Thus, no matter how great Man may be, God is greater, and gives that greatness to us. Thus the next part of the definition: “God is worthy of worship, man is worthy of admiration”. Admiration literally means “to look at”, and we know that by knowing Man/ourselves, we know God. To know God is perfection and completion in all things, and is where our reverence and prayers truly go toward. God is worthy of worship above all, since God is the greatest and, moreover, the Good (II.1), while we have the choice between good and evil and can choose good (VII.6). “God does not appear without man”; after all, “God does not appear to anybody but man” and “wherever man is, also is God”. This makes sense with an older definition, VI.1: “if there were nobody to see [the world], what would be seen would not even exist”. After all, if everything is within Man, and if knowledge of the world is knowledge of God, and if we know God through the world, then God appears to us through the world and through other human forms. So, if we were no Man to exist to see things, then there would be no God to see, and there would be no need for light or things to exist. Yet, here we are, and so “everything exists because of man” (IX.1). So why is it that we exist at all? Because “man is desirable to God”, so God wants Man to exist and live; moreover, “God [is desirable] to man” because we are within and blessed with God which leads us to him as our desire. Where does this desire come from? We know that desire is a passion of the soul that moves it and the body (IX.4), but this desire comes from Nous within our souls (VII.3). Desire as a passion does not come from the world, nor does it come from other humans, but it comes from within ourselves. Thus, “desire comes from nowhere, but from man and God”. Now, one of the things that this definition introduces but does not clarify is why we should worship God. God made us, and God loves us, and God finds us desirable. Sure, okay, we can get that. We also know that because knowing God is immortality and knowledge and love, we also love God and naturally strive to know God. Okay. But why does God love us and find us desirable? This isn’t something said or known yet, and it’s unclear at this point whether the Definitions will say so later on. That said, why would it matter for the Definitions to tell us? Why would God make the world at all? Why would God make things the way God did? These are purely intelligible things, I’d claim, that are not for humans to know, at least not those without Nous. Suffice it to say that it gets us started on our path to God to know that God loves us and God wants us to live and perfect ourselves.